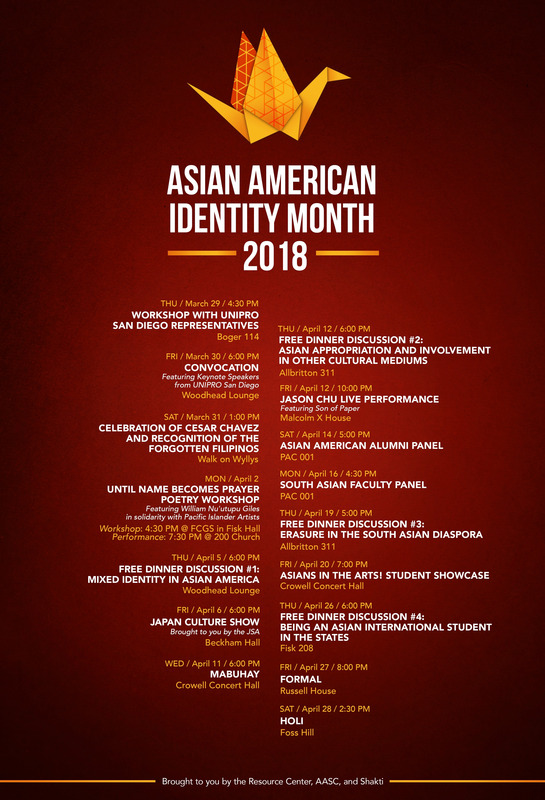 The Asian American Student Collective (AASC) and Shakti are holding a month-long celebration of Asian-American culture, identity, history, and activism from Thursday, March 29 through Saturday, April 28. Events will range from a celebration of Cesar Chavez, to a poetry workshop, to a live performance from Jason Chu in Malcolm X House. “Together, we will explore issues that affect Asian people living in America in the context of mixed identity, interracial relations, and what it means to be an international Asian student at Wesleyan,” the event’s Facebook page said. According to Kyle Shin ’20, a board member of the AASC, the AASC and Shakti planned the month-long celebration from the beginning of last semester. The month will be comprised of sixteen events, but not all of the events will be run directly by the AASC and Shakti, a student organization which promotes South Asian culture and identities. The Mixed Identity Dinner Discussion, which took place on April 5, is one example of an event created in collaboration with another club. Planning the celebration was hard work as the AASC and Shakti faced many obstacles putting it together, particularly when trying to acquire money, finalize contracts, and plan the events themselves. Ultimately, Shin hopes that Asian American Identity Month will clear misconceptions within the community regarding Asian-American students, their identity, and the role of international students within the community. Shin believes that this year’s work will make planning the month easier in the future as well as make PoC event planning more visible to the greater student body.